You may have wondered at some point or another: “Can you be spiritual and still make money?” I’ve created a business out of my love for the Tarot, and I do generate a profit. 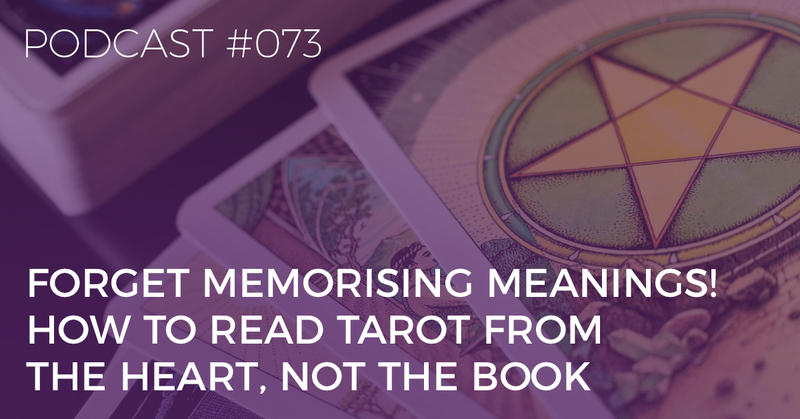 It’s for this that I’ve been criticised, and I wanted to devote a whole episode of the Biddy Tarot Podcast to talk about the truth about money and spirituality. In Episode 118, I talk about why I think it can be spiritual to earn money in a spiritual way! 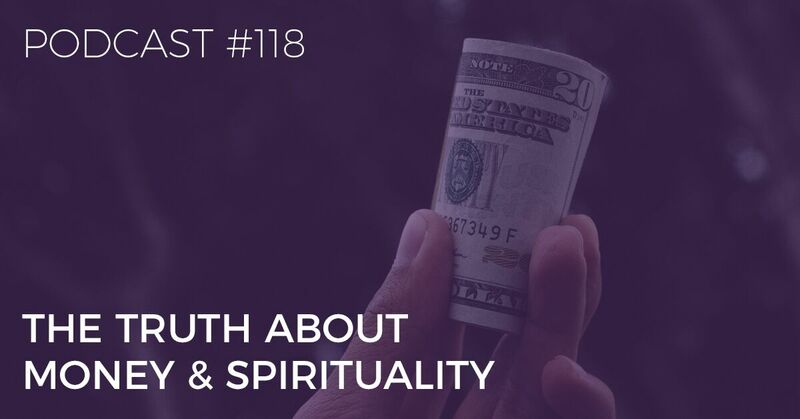 You’re listening to the Biddy Tarot Podcast, and this is Episode 118: The Truth About Money and Spirituality. Hello, and welcome back to the Biddy Tarot Podcast. Now, I’m actually recording this during a bit of a rain/thunderstorm right now, so if you can hear a little bit of background noise, maybe even the rumble of thunder, you know why. We are getting an absolute soaking. And I tell you what—there is also never the perfect time to record a podcast! Let me tell you that. Every time I go, “OK, I’m going to wait until I get this perfect half hour,” it never happens. There’s always a bird or some kind of interruption, or maybe the rain, whatever it might be. So, I hope that you can put up with just a little bit of background noise. Today, we are talking all about money and spirituality, the truth behind money and spirituality, and how these two go together. Now, my goodness me! I have been in the position where I’ve been personally criticised for creating a business out of Tarot and creating a business that does generate a revenue. It does generate a profit. It helps to sustain our family. It also helps to sustain another 13 people who are part of my team. And yet, it’s something that does get criticised. And probably a few years ago, had I been exposed to some of that criticism then, then I might have had a different response—I’m thinking tears in a bathroom somewhere. But what I’ve learned over the years is to really stand by my choice to have a business—a profit-generating business—that happens to be in Tarot. I want to talk about this topic today of money and spirituality, because I bet you’ve been in a similar situation. If you started either thinking about creating a business with Tarot, or maybe you already are charging for your readings, maybe you’ve come up against this too, where people say to you, “You shouldn’t be charging money for your spiritual gifts,” or you have an inherent feeling within yourself that maybe there’s something wrong with the idea of making money from a spiritual place. The sad thing is that so many people end up holding themselves back from earning money because of this belief—either conscious or unconscious—that it just isn’t spiritual to earn money. Today, I’m saying phooey to that! I just want you to take a moment right now and think about your beliefs about money and spirituality. I want you to just check in right now: What is your relationship with money? Is it something that feels good for you? Or does it feel a little bit dirty or a bit messy? A bit complicated? What is your relationship with money? And if you had a lot of money, would you still be a good person? Would you still be a spiritual person if you had a lot of money, an abundance of money? And what would others think of you if you did have a lot of money? I just want you to check in: Do you personally think it’s right or it’s fair to earn a lot of money using your spiritual gifts and helping others? Does that feel right to you? And, ultimately, should you be paid to work whilst helping people? Should that be something that you receive an income for? Just check in with your answers on that. Again, there are never any right or wrong answers, but it will give you an indication of where you’re at right now in terms of money and your spiritual gifts. Perhaps you might have uncovered some unease. Perhaps even feelings of shame or guilt or dirtiness around money. Or maybe you’re a little bit more like me, and you’re like, “Hell, I’ve got a great relationship with money, and I welcome more and more of it”? I’m going to talk with you a little bit about why that is my belief, but for now, just check in with where you’re at. My personal opinion is hell yes, you can! In fact, I strongly encourage you to consider… If you do have spiritual gifts, and you want it to be your main focus for this time in your life, then I encourage you to welcome money into your life. If you’re sitting here, going, “Brigit, I do not want to earn money for my spiritual gifts,” that’s absolutely fine! Please, don’t think that what I’m saying here is that you have to earn money if you want to be a spiritual practitioner. You don’t. We all have choices. But what I do want for you is to have a healthy relationship with money and to see that there is a healthy flow of energy between money and spirituality, that the two can coexist quite beautifully together and that they do not have to be at loggerheads with one another. So, that’s what we’re going to talk about today: Can you still be spiritual and make money? I’m going to start with why some folks say no, you cannot be spiritual and make money. The reason I want to share this with you is, well, one, to give a bit of a balanced point of view, but two, because it’s important to understand where people are coming from and what it is that’s driving the opinion that you can’t make money and be spiritual. I did a little bit of research, and do you know what? To be honest, I could only find one blog post… I’m sure there are many more, but I could really only find one that was against making money and being spiritual, whereas the large majority were around “You can actually do both.” Anyway, interesting! Well, it might shift some of the dynamic, but I suppose it’s an interesting point. I disagree! But anyway, these are the arguments. I’m trying very hard to hold my tongue! I get this. There’s that worry or fear or anxiety that, once we turn to money, we start turning into “scammers,” or we’re solely driven by profit, and therefore, we use our connection with spirituality. But again, I argue so strongly against that because I so believe that you can bring the two in together in a really beautiful way. Anyway, I’ve got to bite my tongue. And the last piece to why people say you can’t have money and spirituality together is that there’s this idea that it starts to dumb down spirituality, and spirituality becomes more about a marketing message than it does about a spiritual message, and you start using spirituality to manipulate people into buying a product. With anything, you can take it too far. There are always going to be bad eggs in any industry who will do things that are not necessarily ethical. But does that mean that the whole concept of money and spirituality cannot exist in a harmonious way? Absolutely not. If you’re a spiritual practitioner, and you’re looking to create a profitable business, does that mean you’ve suddenly just let go of all of your spirituality? I don’t think so! That’s not my opinion. But I believe something quite different, and I want to talk a bit about why I believe that money and spirituality can go together beautifully. In fact, I think when we combine spirituality with money, we become much better custodians of money. Also, when we combine money with spirituality, I think we can spread our spiritual message much further, in a much bigger way, when we’re leveraging money as part of that, and I’ll talk a bit about why that is. WHY IS IT ACTUALLY SPIRITUAL TO EARN MONEY IN A SPIRITUAL WAY? So, why is it actually spiritual to earn money in a spiritual way? #1 MONEY IS AN EXCHANGE OF ENERGY. Number one, I strongly believe that money is an exchange of energy. Now, in our society, we are a typically capitalist society, and it’s a tangible representation of an exchange. It’s money. Maybe back hundreds of thousands of years ago, you might have had the shaman who did a spiritual practice for somebody, and maybe they swapped a chicken, right? The shaman helps a person get better; they get a chicken, right? Nice exchange. Or maybe eggs if they’re vegetarian! There’s an exchange. Now, in these days, we actually have money as a representation of that energy. Really, money, in this society, is a way of acknowledging that exchange. We’re beyond those days of where we could do a literal trade or barter. Some people still do that, and that’s absolutely fine, but money is typically the way that we honour this exchange of energy. Even in a spiritual practice, there still is that exchange of energy, and that is marked with an exchange of money. #2 MONEY IS A REPRESENTATION OF THE VALUE YOU DELIVER OR RECEIVE. Here’s another thing that’s very close to my heart when it comes to money and spirituality: I strongly believe that money is a representation of the value that you deliver or receive. And I think this really came through in my management consulting days, where we learned very much about creating value for our clients, and that became a huge part of our vocabulary. Now when we’re launching, say, a product, I get super excited when we have a really successful launch, and the money is flowing, because I see it as an indication that we are delivering value to our customers. If we weren’t delivering value, we wouldn’t be receiving this money, right? So, for me, money is that representation that you are adding value to somebody’s life. And I suppose it goes an extra step in that, if you want to increase your prices or raise your rates, you think not just about “How can I make more money here?” but “How can I increase my value?” To me, that’s a win-win, and I think that’s incredibly beautiful and spiritual. When you look at money as a representation of value, you’re serving your clients in a much better way, and it’s, again, that indication that you are delivering value. When I set prices for our programs, our products, our services and so on, I need to feel confident that I’m delivering on the value of that product, so I’m not going to charge $1,000 for a certification program if I’m not confident that it’s going to deliver value! It’s incredibly important to me that I can stand by a $1,000 program; otherwise, I’m not going to charge that amount of money. It might be that it’s possible for me to earn $1,000 per enrolment, but I can’t do that with an integrity if I don’t believe in the value that is going into that. Myself and my team, we’re constantly looking for ways that we can increase our value, and how we can go above and beyond. Right, so that’s number two, that money is a representation of value. #3 MONEY IS AN ENABLER. Now, here’s number three: Money is an enabler. Like it or not, money makes the world go around. It allows us to do this, and when it comes to a spiritual business, money allows you to manifest on your vision. If my vision is to reach 10,000 people through our training programs, money will help me do that, because money is what gives me, say, money to do advertising, to do marketing campaigns, to nurture our Community and our tribe. And ultimately, it’s what will help me get my vision out there. Now, is it the only thing that’s going to help me get the vision out there? No. There are many other things, but money is an enabler of something much bigger. Again, it’s not just the money itself, but it’s what it facilitates and what it creates and what it means that you can do as a result of having that money. #4 WHEN YOU PAY, YOU PAY ATTENTION. Thing number four is when you pay, you pay attention. So, what does that mean? Well, when did you last take action on something that you received for free? Or maybe you’ve bought something at a low cost, and then you’ve just done nothing with it. You buy it, but you don’t do anything with it. When you invest good money—a decent amount of money—in something, you actually invest your energy and your commitment into that thing. I had it recently where I offered, actually, a free business coaching session to somebody. It’s the same with Tarot readings, right? When you offer a reading for free, it’s a different exchange, and it’s a different setup to when you might offer a reading for $100. I know that as a client, I have seen a psychic reader who is well-known, and I think I paid maybe $500 for a session, and I’ll tell you what: I listened to every single word she said to me. I recorded it. I went back through it. I wrote down action plans, because I thought, “You know what? If I’m going to pay $500 for this, I’m going to get something out of it. I’m going to get value out of this.” And I made sure of that. Now, had that been a free reading, I might have just listened and gone, “Oh, yeah, that’s interesting.” Take it or leave it. So, think about that with your clients. If you’re offering your services for free or at a really low rate, are they paying attention? If they’re not paying, are they paying attention to you? Maybe not. Now, don’t get me wrong: I’m not saying that every time you give something away for free, no one is going to value it, and they’re not going to take any action. There are certainly some cases where people do amazing things with free things. I put all of our Tarot card meanings, being in Google… That’s all down to a free e-book that I got in 2009, and I actually did something with it, right? So, it is possible. But what happens for many of us is that we just tend to not take action unless we have put some money down. In some ways, having a higher rate for your Tarot readings means that your clients are more invested in that reading, and people who pay for their sessions tend to have more success with their work. Like it or not, that tends to be the thing. So, when you pay, you pay attention, and you need to have those higher rates so that people will be more inclined to be more invested in that session. #5 SPIRITUAL PEOPLE NEED TO MAKE A LIVING, TOO. Now, the last piece to this is spiritual people need to make a living, too. I put this last. I know this is an argument that often comes up. It’s like, “Well, we can’t offer our services for free, because I’ve got to still put food on the table,” which I totally get, but I actually think this is a less important piece to the puzzle. What’s more important is that you are creating value, and money is a representation of value. I think that is first and foremost in your mind when it comes to money and spirituality. It’s more of a secondary thing about needing to earn an income. I was reflecting on this because I thought, “OK, well, what would happen if I didn’t earn any money from Biddy Tarot? Would I still do it?” And in all honesty, my answer would be no. It might be a side hobby, but ultimately, the answer is no. Now, is that because I’m not actually truly passionate, and I’m not really genuine and whatever? No, definitely not. It’s because I’m the primary income earner for my family, and I need to earn some kind of income. Now, if Biddy Tarot earned no income, I can tell you I would not be able to dedicate 40 hours every week. I would not be able to support our team of 15 in creating this company. I would not be able to give all of the free content that we do if there was no income. Ultimately, we do need to generate some kind of living income from our spiritual work if it’s going to be our main focus, and I think it’s kind of ridiculous if we’re not generating an income from this work, because what it will mean is that there will be much fewer spiritual practitioners out there if we said, “You know what? Don’t earn any money. You can’t do it.” It’s just not sustainable. It is not sustainable! We do need to earn at least a decent living to make it sustainable. So, that’s why I believe that having money and having a spiritual business can go hand in hand. There is nothing dirty about money and spirituality. In fact, I think both just coexist beautifully when you have a really positive relationship with that money. HOW DO YOU STAY SPIRITUAL AND PROFITABLE? Look, I get it—you can go off track with money and spirituality. You can get into a place where you lose the idea of… It can just be about making money and making lots and lots of profit, right? I get it. You can go off the rails. But as with anything, this is all about keeping things in moderation and keeping things in balance. So, how do you stay spiritual and profitable? Well, number one, focus on value. When you focus on value, it’s a win-win situation, right? The more value you deliver to your client, the more that they get out of it. The money is the representation of that value. In some ways, by increasing your rates, you’re increasing your value, so long as you’ve got that relationship going on there, that you’re aware: “When I’m increasing my rates, I’m increasing my value,” and you’re making a conscious effort to do so. Then that will increase your money flow, right? #2 LIVE IN ALIGNMENT WITH YOUR VALUES. Number two is live in alignment with your values. When you’re creating a profitable spiritual business, don’t do dumb stuff to make a quick buck. Don’t fall into those sleazy marketing techniques that are designed just to make a ridiculous amount of money in a short period of time whilst screwing everybody over. That’s not the idea of a spiritual business. In fact, it’s important that you’re doing what feels in integrity with your own personal values. I mean, I do it in the Biddy Tarot business. I am constantly checking in with my intuition: “OK, are we heading in the right direction here? Is this in alignment with my values? How do I fundamentally feel about my pricing? How do I fundamentally feel about the value that we’re delivering and what we’re putting out into this world?” And I always make sure that it’s in alignment with my values. I’ve had a number of times where maybe we’ve had some copywriting done, and I read through it and go, “Ugh, not me. That’s not me.” I change things around, because yes, it might work in other businesses, but it’s not in alignment with my values or my style. So, to have a spiritual and profitable business, then make sure that you are living in alignment with your values. #3 BE THE CUSTODIAN OF THE MONEY. All right, thing number three is be the custodian of the money. Be the custodian of your money. Stu McLaren, the Founder of WishList, is a millionaire. He’s got a lot of money, and he has this… Actually, when he was running WishList, he had this realisation that, for every license of WishList… Sorry, WishList is a membership software that you can use on your Wordpress site and what have you. Now, he was selling that at $97 per license, and he quickly realised that $97 would pay for a teacher in Africa for a year in a school. I think it was something like that. So, he started to get very motivated about making as much money as possible so that he could then sponsor teachers in Africa. He is now working towards the goal of not so much tithing just 10% and keeping 90% but flipping it. He wants to tithe and donate 90% of his income and keep 10%. Now, does he live in a tiny apartment flat? No, he lives a very comfortable lifestyle, but he’s so motivated to create as much money as possible so that he can direct it in the right ways. We do something similar with Biddy Tarot. We are actively donating our profits and sponsoring certain things. For example, we sponsor three schoolchildren here in Australia. We often invest in Kiva and the microfinance deals at Kiva. And there’s also a group called Opportunity Australia, where we make donations, and they set up either microfinance deals for women in developing countries, or they’ll also setting up health leaders in India. They’re setting up women to be health leaders in their local communities. So, I love it because it means that we’re creating this beautiful gift of money, and I get to send that money to something that I know is worthy and valuable, right? The creation of money becomes exciting, because I know that I can put it into awesome places, and I become that custodian of money. All right, and now, the second to last one for how you can stay spiritual and profitable. What I mean by that is give away free content, and you can also do charity events. You could do scholarships. Whatever it might be, having those opportunities where there’s also free alongside paid is a good thing. Now, we’ve made a conscious choice not to do scholarships. We did do a few at the start, and some of them worked really well. Others we just didn’t get the commitment. But yes, we’ve made a decision not to do the scholarships, because when you pay, you pay attention. That’s been quite important. But what we do do at Biddy Tarot is this podcast! This podcast is absolutely free. We also have the Tarot card meanings pages, which we are effectively giving away for free, and over 4 million people every year are taking advantage of those pages. So, what I love about our business model is yes, we’re profitable, and we’re generating an income, but we also have this capacity now to give free content as well, and to create those free opportunities, because we have the income as well. Again, that money is an enabler. It enables you to do really awesome things. Now, the final thing is to love your money. You don’t have to pat it and whatever, but when you pay your bill, bless that bill. Bless the money as you send it off. Look at your bank accounts every day. Send all that good juju and love into your finances, and you’ll find that your really positive energy starts to filter through into your money, and that, I believe, is where spirituality and money come together. Do you have to make money from spirituality? Am I saying that you must be making money for you to be adding value and so on? Absolutely not. You have a beautiful thing called free will and choice, and you can choose exactly whether you want to charge for your Tarot readings, or you don’t, and whether you want to charge a lot or a little. It’s completely up to you. Are you making a conscious choice about your relationship with money? Or are you letting fear and anxiety get in the way, preventing you from charging what you feel that your services are truly worth? After being at the brunt of a lot of criticism around being a profitable business, I think it’s important to also not judge or criticise others, and we need to accept and respect the choices that people make whether they do want to make money from a spiritual business, or whether they don’t. The thing is that it is a free market, and if you’re delivering value—even if you’re charging high prices—that’s going to be great, because you’re going to attract the right people into that space. Yeah, I think that’s what I wanted to say! Beautiful. So, I’m going to wrap it up there just because I’ve kind of lost my train of thought for a second. But really, I want you to have this clean and clear relationship with money, particularly if you’re a spiritual practitioner, and you are charging money, or you’re about to start charging money for your readings. I want you to know that there is no judgment. You can do whatever you feel called to do, but I want you to do it in a way that is with love and with openness and with a really good feeling. You can make money from a spiritual business, and it can be a very ethical, clean practice—that’s for sure. All right, I’m going to wrap it up here before I just keep rambling on. I hope you have an awesome week. If you are a professional Tarot reader, maybe you might be inspired to look over your prices again. If you’re thinking about becoming a professional, you might think about it a little bit more. But in the meantime, I hope you have an awesome week, and we will connect again very, very soon. Bye for now!